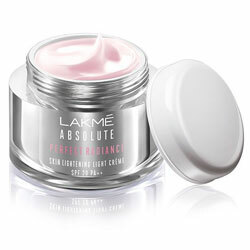 Lakme Perfect Radiance Fairness Range with the help of exotic ingredients works from within to give you fairness that's ultimate and complete. 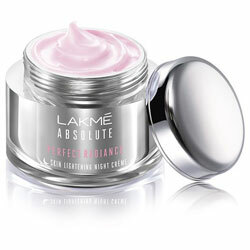 How does Lakme Perfect Radiance Fairness Range make you fair? Its gentle deep cleansingaction reveals skin that's soft, bright and sparkling. For best results, top it up with the Day Cream or the Day Lotion for perfectly smooth, fair skin. potent skin lightening vitamins continuously into your skin epidermal cells through the day. Targets melanin build-up and helps control further production. Micro- targets the six fairness blocks at the source and works with precision to unblock your fairness. Freedom from all 6 fairness blocks. * Fights the 6 blocks to fairness and leaves you with perfectly fair skin forever, with a continuous use. 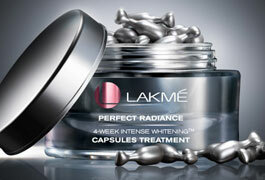 Lakme' Perfect Radiance Range now elevated to a new level of luxury and efficacy. Enriched with precious micro-crystals, this renewed range gives you a fair, illuminated look. This skin lightening day cream, with precious micro-crystals and skin lightening vitamins gives you a fair, illuminated look. Its sunscreens protect the skin from sun damage. For Best Results Try the Perfect Radiance Regime Day Time : Serum + Day Cream. Night Time : Night Cream. 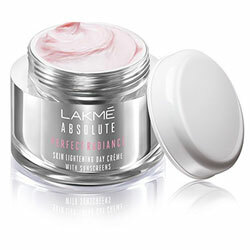 Lakme's Perfect Radiance now elevated to a new level of luxury and efficacy. Enriched with precious micro-crystals, this renewed range gives you a fair, illuminated look. Perfect Radiance light Cream This skin lightening cream, with precious micro-crystals and skin lightening vitamins,gives you fair, illuminated look. Moisture-rich, yet so ultra light that it melts into your skin with a silky feel. Its SPF 20 PA ++ provides sun protection. For Best results try the Perfect Radiance Regime. Day Time : Serum + Light Cream. Night Time : Night Cream. Presenting a foundation for isibly fairer skin. Flawless radiance with great coverage and a soft pearly glow. 95% Indian Women agreed that it makes them fairer 96% agreed that it makes their skin glow. Now you too can discover fairness that you absolutely love. Suitable for all skin types. 1. Goodness of Multi Mineral powder which flawlessly covers all signs of darkening. 2. Brightening Pearls that add a pearlescent glow for radiant skin. 3. Vitamin B3 which is proven to visibly lighten skin tone with regular usage. 4. SPF 23 with UVA and UVB protection. 5. Oil Free, Light-weight, Suitable for everyday use.